This design is pretty close to OD250/Dist+, but i thought it should be added anyway, as there are some slight differences. Funny thing is that the same circuit was marketed and sold as both Vox Distortion and Guyatone Zoom Distortion Box. From what i can tell from the demo, it's really nice sounding thing. These both also seem to be pretty rare items with hefty price tags - if you can find one. In my experience with 250 and Dist+, the pots may give better control with linear instead of original log taper. I have an autowah from that series, it's my favorite pedal of all! It's called VOX 1904 Wah, sounds wicked. Couldn't get any sound at all at first, swapped output 3 (took it to ground) with output 1 and all was sweet. Sounds nice, especially with humbuckers. The only problem is that I don't seem to get the range of distortion that the demo shows. 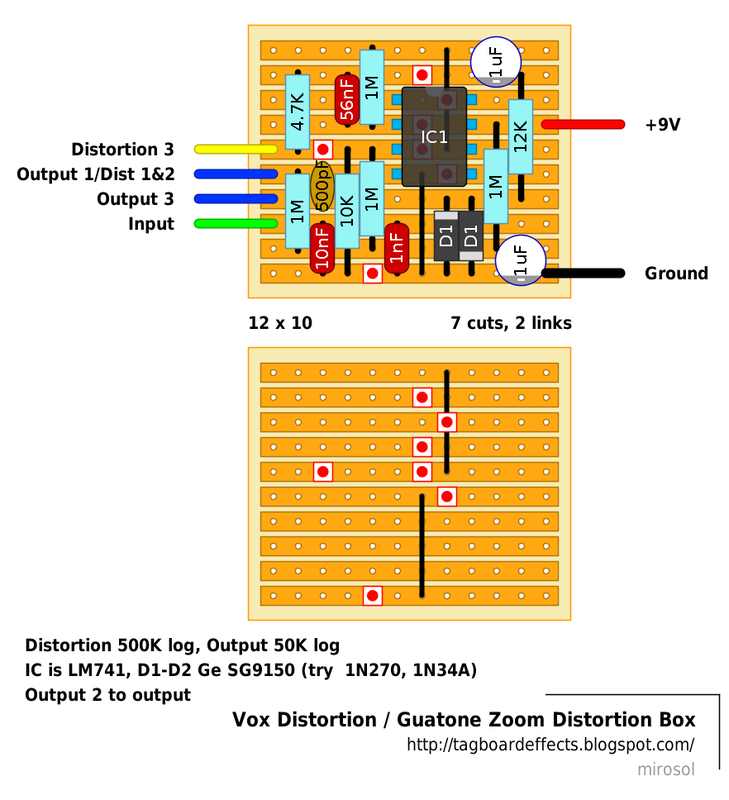 I tried a Log and Lin 500k Distortion pot but most of the range seems to be in the last quarter of its travel. Used a LM741CN and 1N34A diodes - a nice classy brittle distortion. Thanks for the layout. I also had the problem with only getting a clean signal at first. I swapped Output 3 over to the other side of the board to the bottom of the 12k resistor. I used a 100k log pot for the output and a 470k lin for the distortion and the range of distortion is pretty reasonable if you roll back the distortion and increase the volume. Have you tried that Otalgia? Sorry I also moved output 1/Distortion 1+2 up a row, so I guess I've done exactly the same as Otalgia. Yeah, I get a little more range rolling off the volume but still not the range as in the demo. I'm thinking of modding this though as I think the early models had an additional switchable diode pair? Nice pedal all the same. Agreed, I can't compare it to the original Dist+ but it sounds good to me. I've tested the gain again this morning with a bit more volume on the amp and I can definitely get it going from (near) clean to really dirty, maybe the 100k pot instead of the 50k helped? I used 1N60 diodes but I can't imagine that would be the difference? Neighbours have gone to work so just cranked this loud!! Near clean to really dirty is spot on! Gonna leave the amp on asd the tubes are warming the house!!!!!!!!! Graah. Stupid labeling mistake. Now fixed and tagged. super simple build. i used a tl071 and it sounds awesome. Hi, does anyone have any good recommendations for the equivelent diode and cap parts to use to get close to the original tone on this build? Sorry I just found (several) diode recommendations in the blog :), Still interested in what caps you would all recommend. btw I have just been randomly looking around the site for the first time, what a fantastic resource, well done! If you mean what type of caps you should use, then i would recommend mylar greenies or plastic boxes. Thanks, your component guide is excellent, I was looking at a photo inside a zoom and I think you are right there are three greenies but the other three caps are different. I'll go back to your guide and try and work it out. Ah ok. This is my first pedal build so its kind of reassuring to get this advice. One other question if I may, in your experience, do you think there is much noticable difference using strip board rather than a purpose etched PCB? Nice and simple build to start with. Good choice! :)"
I heard the real thing round at my friends last week. Sounds amazing with his explorer, but they are so hard to come by and very very stupidly expensive. I am going to give it a go and then do an A/B see what happens. I've built some on stripboards, tagboards and on PCBs.. I personally prefer stripboard over all - sturdier joints (unless the PCB happens to be military grade with rivets for holes) and suitable for quite big builds.. Differences are mostly with just how you would use the medium. It cannot affect the sound or anything else. Capacitance is capacitance and resistance is resistance. Some folks do their circuits on blocks of wood.. If the connections are there, it doesn't really matter what the medium is. Ah. The freedom. Hello again. Well I built my version of this pedal and it sounds awesome, I a/b tested it against my friends 'real' zoom and it is impossible to pick the difference. Just one dumb question now I have gone back to the schematic. The sleeves from my input and output jacks are obviously connected together. But I also have them connected to the 'Ground' terminal of the pcb. IS this correct or should the sleeves float free from the pedal ground? People do it different ways. Some people connect both sleeves to ground via wires, some people connect just the input and leave the output floating free. You couldn't have both sleeves floating free though, because there is nothing else physically connecting the case to ground, so at least one must be connected. I've always connected all offboard components to ground including both jack sleeves and I've never heard any noise which could be attributed to a ground loop because of it, so I don't worry about it too much. Thanks for the reply :) so my assumption that the input and output sleeves both need to be connected is wrong. I had guess that their would need to be some connection to maintain the cct. Like you say I think I will stop worrying and just leave well alone. the zoom clone and a scrambler I built from a kit both work perfectly with both in and out sleeves connected to the circuit ground. It was a friend of mine who got me wondering. He made a pedal for someone and it reportedly 'blew up' after the user had unplugged an input jack and plugged it back in again. We don't know this for a fact until he gets the unit back. I always connect the output sleeve up too because I don't like the idea of ground being made by that kind of contact. You get all sorts of dirt, grease and machine oil on these boxes and if anything stops that contact being true, even down to the nut loosening a bit, then you could get intermittent faults. Because I've never had any noise that I could attribute to it, I will always connect the output jack as well as the input, because i think the risk of a poor connection and intermittent fault is greater than the risk of a ground loop. Hello, I have built this and, as other people here, I find that the distortion is only noticeable in the last part of the range of the pot. Also, something I think is odd, is that with the distortion completely closed I am getting unity gain only with maximum volume, is this normal? You'll get a lot better sweep for the distortion control with 500k rev log pot. I'll have to check the schematic, but OD250 and Dist+ both have rev log pots for distortion. Also - unity level with volume maxed and gain at zero is a feature. Ah thanks. I will try that. How would you connect the rev log pot? Interchanging lugs 1 and 3 and then shorting 2 with 3?